In English THE is a definite article. – It refers to something specific. However in French there are different forms of definite article. There is LE, LA, L’, and LES. The article that is used in French depends on the noun. As we have already seen in a previous lesson, French nouns are either masculine or feminine. They can also come in singular or plural form. 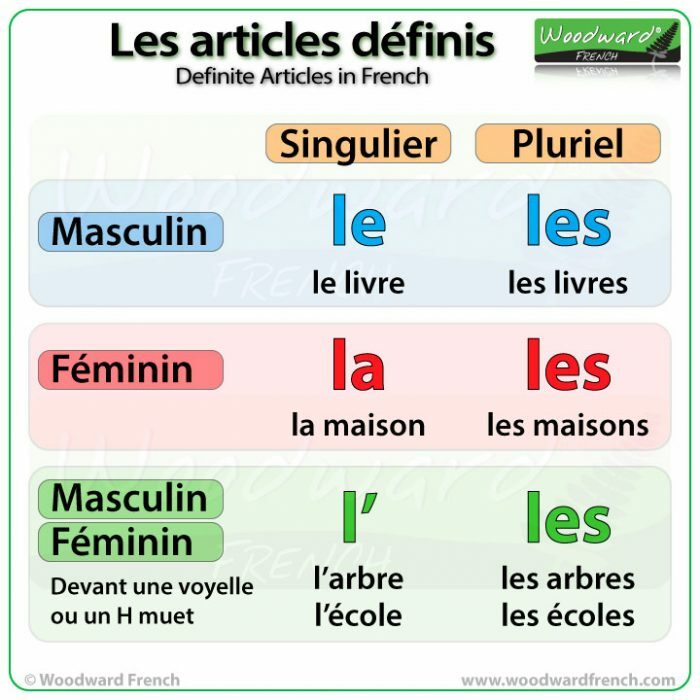 If a singular noun is masculine then we use either LE, or L’. The most common masculine definite article (in singular form) is LE. LE is used before a masculine singular noun that starts with a consonant. L’ is used before a masculine singular noun that starts with a vowel (= a, e, i, o u) or h (which is silent). If a singular noun is feminine then we use either La or L’. L’ is used before a feminine singular noun that starts with a vowel (= a, e, i, o u) or the silent H.
With plural nouns, it is much easier. You always use LES. It doesn’t matter if the plural noun is masculine or feminine, you use LES before it.